2.2.2014. 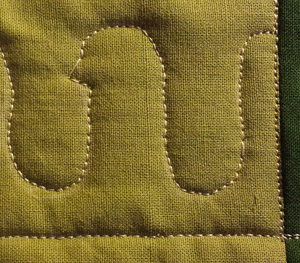 [cont'd from 1.18.2014] I dive into free motion quilting. 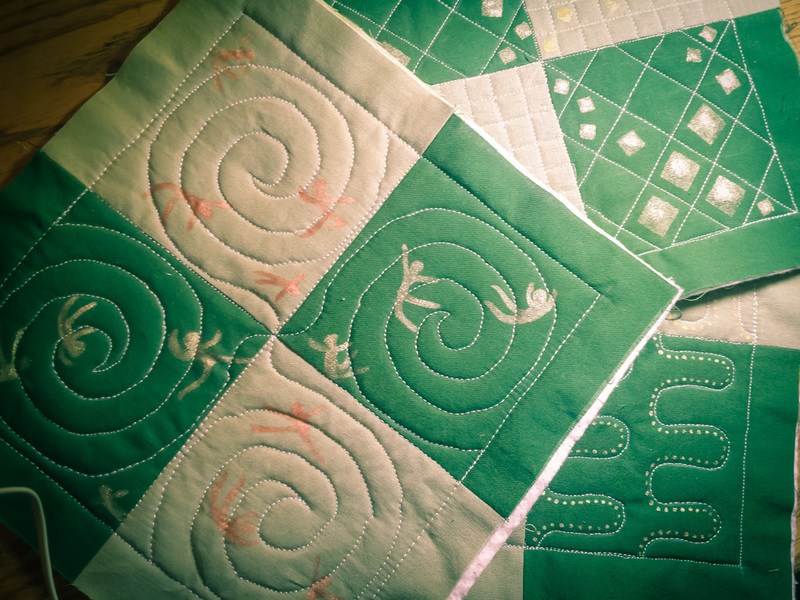 "Free motion quilting" (FMQ) means that the main talent of the sewing machine -- its aptitude for pulling me forward in smooth, regular stitches -- is disabled. The needle just goes up and down. Moving the fabric in any direction to create a line of stitches it totally up to me. It amounts to an existentialist crisis: "So much freedom, so little guidance. God is dead. I am alone in the cold empty universe." 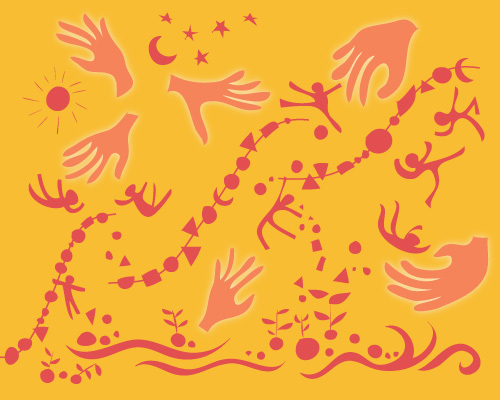 Free motion quilting is a total body experience and requires complete focus and deft hand-eye-foot coordination. For the Building Blocks Quilt Along (BBQA), we are using a quilt-as-you-go method, practicing FMQ patterns on 10-inch sandwiches of our pieced fabric, batting and backing. We trace our patterns in chalk from the instruction manual. Block #1 uses 3 different patterns on a 4-patch block: deep curves, straight lines and big spirals. I do it. The results are so-so, clearly the work of a beginner. Only practice will solve this problem. After Block 1.2: "Quilt block 1.2 done. I don't mind a certain dreamy off-kilterness... I float, I glide, I space out. I allow the energy of the universe to move the me-quilt. But it's those hiccuppy jagged twitches I can't stand. It's like the shoulder troll (you know the one, who tells you everything you do is crap) -- it's like that shoulder troll gives my guiding hand a kick just to prove he's right. Begone, shoulder troll!" The discussion of this "shoulder troll" leads to the happy distraction of making the doll Nadita, Queen of Negativity. For Block 1.1 (curves), I simply dab in dots with a small paintbrush. For Block 1.2 (grid), I use the squares stencil I cut for my travel vest project. After converting it to black on white, thickening some shapes, and other fussing, I send this through a Brother Scan N Cut to make a stencil from an old vinyl page protector. In the end, the hands don't work with my current quilt blocks -- but the little falling figures do. They look cool on my spirals -- caught in the vortex! (also reminds me of the poster art for the 1958 movie "Vertigo."). As we await instruction on quilting Block 2, I do the piecing for Blocks 2, 3 and 4. Jim starts the pattern tracing but is flummoxed by the complexity of the tight patterns -- impossible to see through dark seam allowances on the pieced fabric. I can see I will have to improvise... fun ahead! Resource: Leah Day and her 2014 Building Blocks Quilt Along. Leah Day and her YouTube videos on free-motion quilting gave me both instruction and courage during Quilt #2. My misadventures in free-motion quilting showed I have a lot to learn, so taking it back to the beginning in a baby-steps quilt-as-you-go project seems logical.